Hi dear readers! I’m so happy to be sharing this post with you, I wish I could actually share the cupcakes too :-). These are heavenly little things; baking them will fill your kitchen with the bright scent of lemon and the freshness of basil. 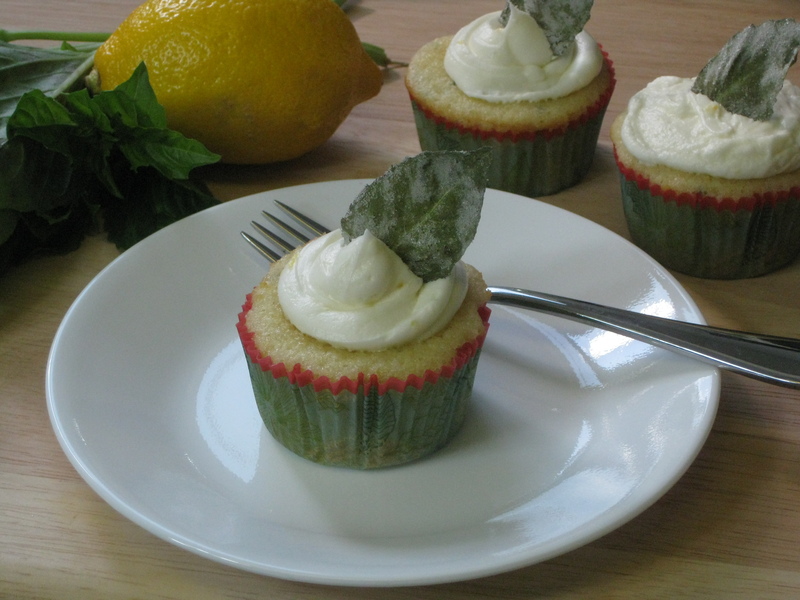 Buttermilk makes these cupcakes moist and topping them with an airy lemon cream cheese frosting and a sugared basil leaf makes these cupcakes elegant enough to serve for a special occasion. If you’re wondering how to use excess basil from your garden, think outside the savory box. Because of its natural freshness and lemony-licorice taste, basil works really well with fruit and as a compliment to other sweet flavors. 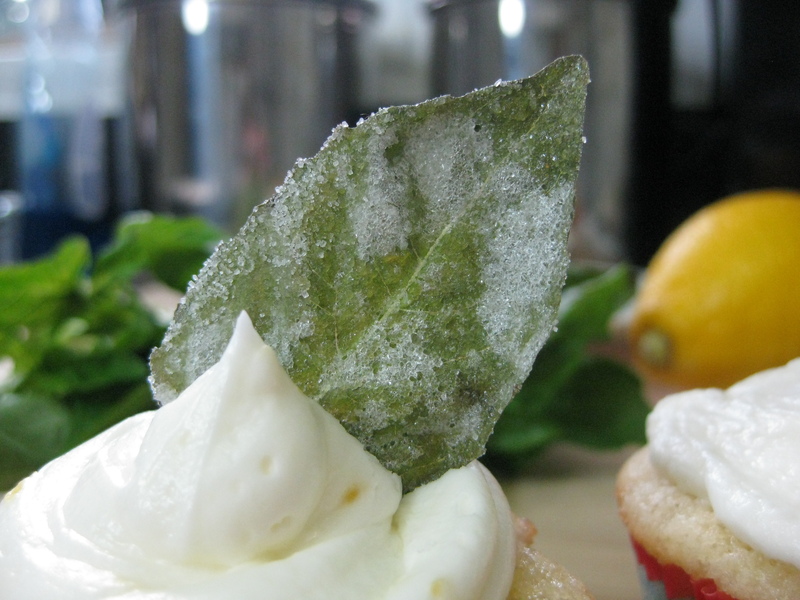 The sugared basil leaf that tops these cupcakes is beautiful proof that this herb was meant to be paired with a little something sweet :-). Preheat oven to 350°. In a medium bowl, combine flour, salt, baking powder and soda. In a large mixing bowl with an electric mixer, beat butter until fluffy. Add sugar, lemon peel, basil and lemon juice, mix just until combined. Add eggs one at a time, beating well after each addition. Alternate adding the flour mixture and buttermilk, mixing until combined. Scoop batter into 24 lined cupcake tins, I used an ice cream scooper to divvy up the batter. Bake cupcakes for 12-14 minutes, check for doneness by inserting a toothpick in the center. Remove from tins and let cool on a wire rack. For the basil leaves: Wash and thoroughly dry the basil leaves. Beat the egg white until frothy, set aside. If you don’t have superfine sugar on hand, put the sugar into a food processor and grind for 30 seconds. With a pastry brush, brush the basil leaves (one at a time) with frothy egg white- then immediately sprinkle generously with the superfine sugar to coat the leaf. Shake off any excess. Let dry for at least three hours- the leaves will stiffen and the sugar solidify. 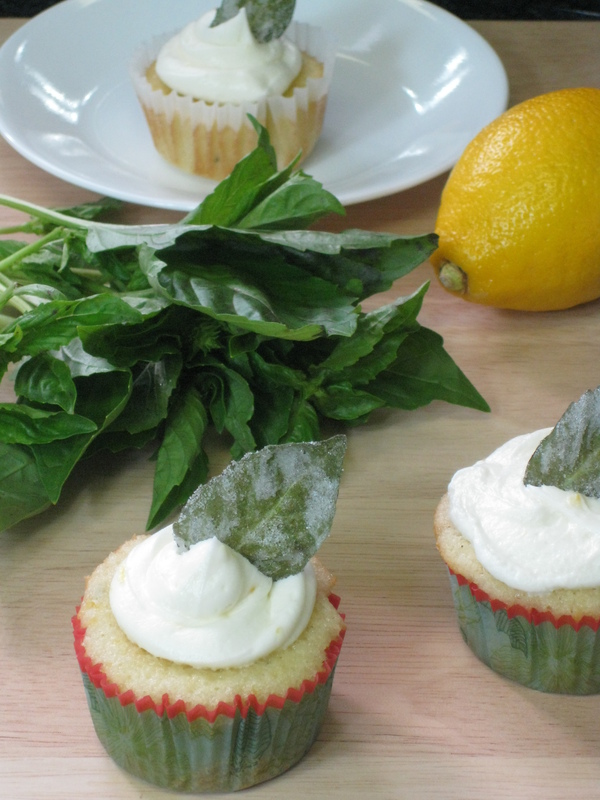 Top each frosted cupcake with a basil leaf. For the frosting: Beat together the butter and cream cheese with an electric mixer. Add in the lemon juice and zest, beat until for 3 minutes or so until the mixture becomes more fluffy. Gradually add in 2 cups of powdered sugar, mix well. Beat in another 2 cups powdered sugar until the frosting reaches a consistency you can spread. Now get frosting! Daily Question: Do you have a delightfully tasty but unconventional flavor combination that you want to share? Please do! 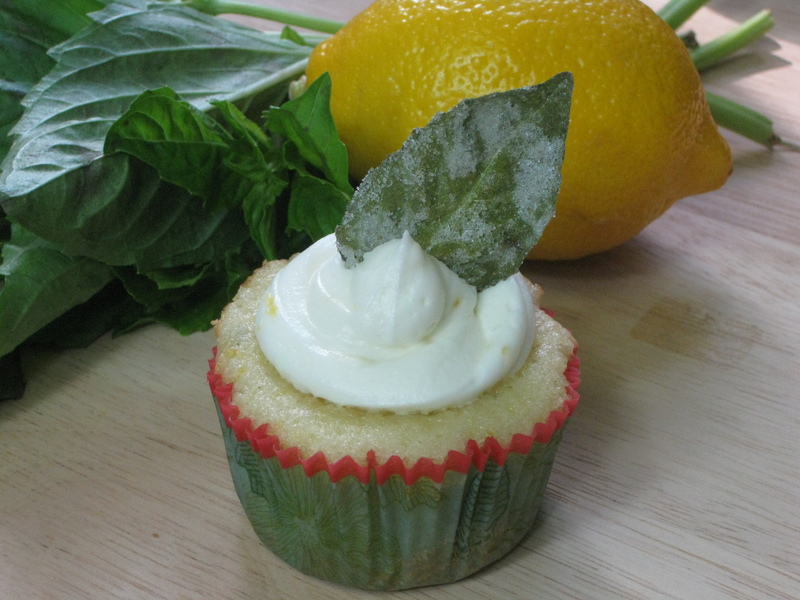 This entry was posted in baking, dessert and tagged basil, cooking, fresh lemon cake, gardening, how to make sugared basil leaves, how to use excess basil, lemon cream cheese frosting, lemon-basil cupcakes, summer lemon dessert. Bookmark the permalink. Two of my favorite flavors, basil and lemon. How Refreshing! These sounds like a great summer dessert! I love watermelon with basil, too. Yes! That is a great combo, with some feta cheese too… nom nom nom. These sound great. I’ll add them to my list of “to try”. I absolutely love the leaf garnish…inspired! Thanks Christina! Lemon and basil and blueberry would be another yummy combo too I think, maybe in a rustic tart. I have so many different baking ideas but just don’t have time to do everything, lol. Thanks Jess, I’m looking forward to the next contest.